I beg to differ. Once you understand a little bit about the differences, you can actually become very much at ease with the driving situation in Italy. It’s true there often is more speed than necessary. Italians are passionate and energetic people and you won’t find them doing silly things like staying within the lines and taking their turn to get out the highway exit. But there are signs that things are changing rapidly, and this is making driving a little more sane. We have seen it change a lot over the past decade. The Italian government has put in place a point system in the past few years that they are enforcing vigorously. Every driver you talk to here is aware that their license can be taken away for a time period that is much more severe than you would find in other countries. Each driver gets twenty points, and points are deducted for infractions along the way. 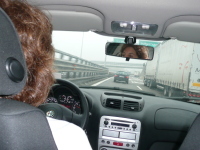 The penalties are severe, so for this reason you will see the Italians slow down on the highways, honor traffic signals and avoid the most egregious of traffic crimes—talking on a mobile phone while driving! You often see drivers pull to side of the road to talk rather than be seen talking on a phone and driving. Hands-free sets are okay, though. Much of the difference in driving is due to the fact that cars are much lighter, faster and maneuverable here. You can move quickly to get into or out of a situation. You can park in tighter spots. You can get around the trucks. And most importantly, you can pass on country roads to get around the tractor that just pulled onto road from the farm. We don’t recommend that you try these tricky passing techniques, but you will see the Italians doing them, solid line or not. If they can see just a bit ahead, they will do it. And if someone is coming toward them, oh well. Everybody compensates. Again, don’t try this yourself! When approaching the toll plaza from the autostrada, look for the lane for ‘Carte’ to pay by credit card, or look for the money pictures to pay by cash. The other lane type is for ‘Telepass’, which is for the Italians who have the electronic devices in their cars to let them through automatically. In many cases, they will alert you that there is electronic surveillance for speeding, so if you see a sign about ‘controllo eletronico della velocita’ – slow down! You will likely see the camera on the side of the road very soon. And if you are unlucky, you may get bad news from your car rental company after your return home. Roundabouts are handy ways to control intersections, and they work quite well to keep traffic moving. When approaching, just keep in mind that the driver already in the roundabout has the right of way. So look carefully at the other cars and if they are continuing toward you, just stay where you are at wait to enter. Other drivers will do the same for you. And remember – if you want to confirm what the signs say, just take one or two extra loops around to make sure. This is better than making a snap decision and getting lost. With all this being said, you can still relax about driving in Italy. Yes, it’s a little more interesting, but if you just pay a little more attention, it’s actually easy and fun! This entry was posted in Getting Around in Italy and tagged driving in italy. Bookmark the permalink.